HERE SHE COMES! Here she comes! The cry. swelling to a tumult swept like wildfire through the unprecedented crowds besieging the Geelong railway station on that never-to-be-forgotten evening on Saturday, October 10, 1925. With whistle shrieking, the football special was steaming in. amid an inferno of noise. 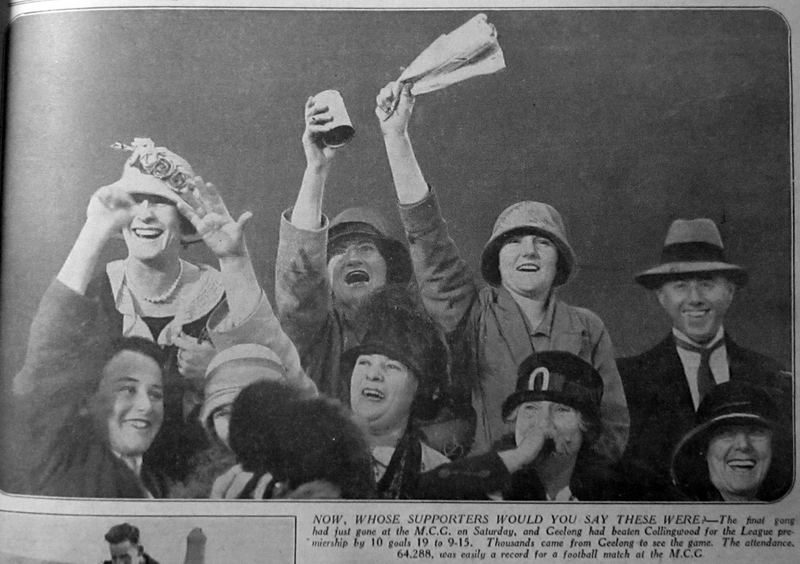 On board, among hundreds of cheering supporters were the Geelong football team - League premiers for 1925 straight from their triumph over Collingwood in the Grand Final on the Melbourne Cricket Ground that after-afternoon; a glorious victory that had brought Geelong their first League premiership after 28 years of earnest striving. What a welcome home-a welcome fit for Royalty. thundered by 15.000 fervent patriots. Their mighty ovation made mightier still by a brass band. 3000 tooting motor cars, a babel of bells and whistles, and 200 detonators exploding. Never before or since has a premier team in Australia received such acclamation from its supporters. It was a more boisterous night than Armistice night. It recalled the fervor aroused by the visit of the Prince of Wales to Geelong in 1920. It ushered in the wildest night in the history of that normally quiet and respectable city to be followed by “Headache Sunday” The “Sleepy Hollow” myth was submerged and drowned in that tidal wave of roaring humanity. Forwards: Rankin (c), Hagger, Hudd. Half-backs: Tyson (c.), Makeham, Wilson. Half-forwards: Harris, F. Murphy, Lawn. 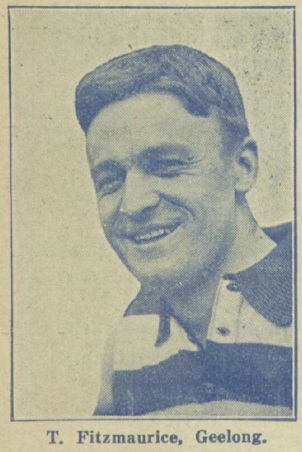 NOT quite class enough to make "the four" the previous season, Geelong, under Cliff Rankin's coaching and captaincy, shot to the front in 1925. Before long they were the leading team. A clever combination, they played virile, match-winning football, and. unlike previous Geelong sides, were almost as powerful away as at home. In the home and home matches they were defeated only twice—by North Melbourne on the opening day, and later by St.Kilda in an amazing struggle, in which the honors were as much with the losers. In between Geelong won 12 matches on end. Their proudest achievement was to defeat Collingwood twice. In those days, as now, victory over Collingwood somehow seemed sweeter than over any other team. There is a certain hall-mark about it—like a Test batsman scoring a century at Lords. Collingwood just “pipped" Fitzroy for fourth place on percentage. Football positions were rather topsy-turvy then, compared with now, for St.Kilda finished sixth. Richmond seventh. South Melbourne eighth and Carlton ninth. 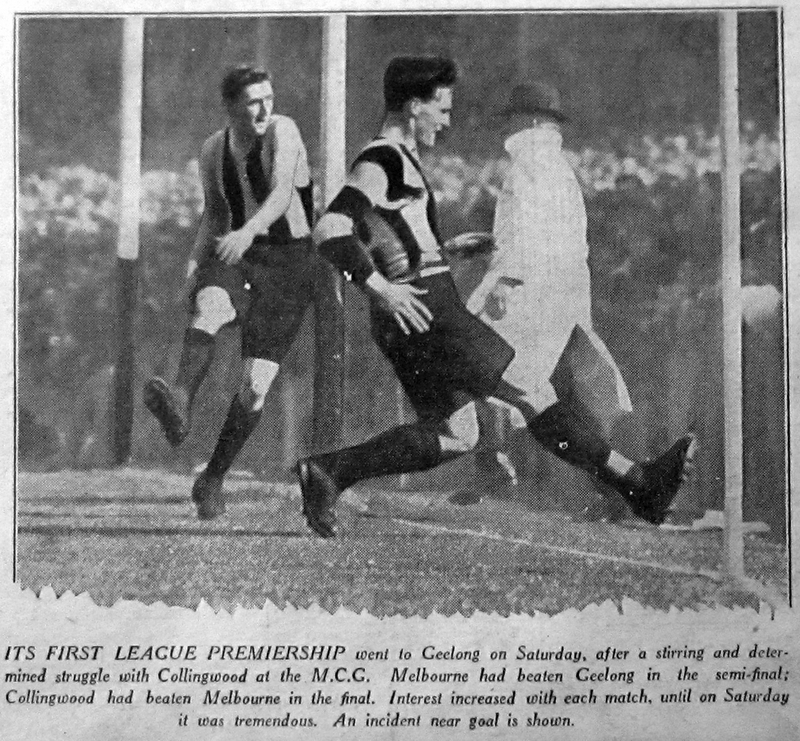 In the first semi-final, before 60,065 people on the M.C.G.. Collingwood defeated Essendon 12.6 (78) to 10.8 (68). It was a hard fight. 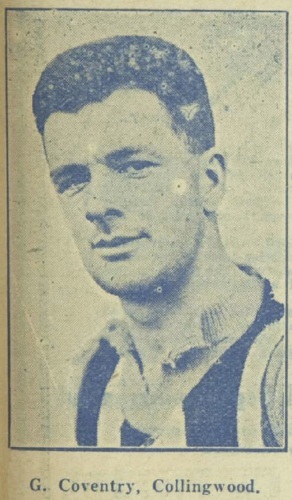 Frank Maher led Essendon, Gordon Coventry kicked five goals for "Wood. Came the grand final between Geelong and Collingwood. 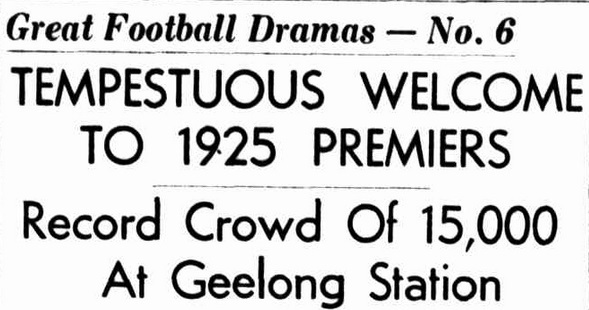 to decide the1925 premiership; 64.288 people flocked to see it—a record football crowd for Victoria up to that point though it has since been exceeded several times. Geelong turned out to a man—and woman; 8000 supporters invaded Melbourne—6000 in five special trains, and 2000 by road. Eager crowds stormed the trains at Geelong station, sweeping away barriers and breaking carriage windows. They were keen, these Geelong Enthusiasts! Geelong was deserted that afternoon. Work was forgotten. Football was all that mattered. Many factories and businesses closed all day. Queues were outside the Melbourne Cricket Ground as early as 10 o'clock, i The first patron arrived at nine! The great moment arrived. Out bounded the teams. There was no mistaking which the crowd wanted to win. Collingwood were applauded; but a tremendous ovation greeted Geelong. Then McMurray bounced the ball and the last grim fight of the 1925 pennant was on. The game opened brilliantly, with Collingwood just a trifle more confident but not so deadly forward as Geelong. Gordon Coventry was off the target. Already it was strenuous with Geelong standing right up to the ‘Woodsmen and meeting force with force. Early it was evident that this Geelong side would not falter. Nor did they. Applying the pressure relentlessly, Geelong really won the game in the second quarter, when they rattled the Magpies with devastating drives. Geelong were the stronger side all round. A master stroke in strategy this term was Rankin's shitting Hagger out to half-forward, and getting goals himself. Many aver that this move sounded Collingwood's doom. Still no goal from Gordon Coventry-a catastrophe for the Magpies! And so it went on. Geelong always the masters, until, near the end. 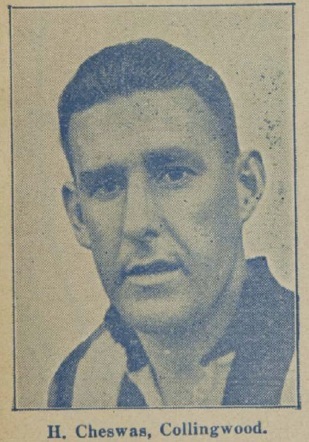 Collingwood, in a typical fighting rally crept to within eight points of Geelong, who at the final change had led by 25 points. The thrilling recovery electrified the crowd. But Geelong, with the game in the balance, fought back, and added two precious points. Then, staking all on a last desperate onslaught, Collingwood crashed forward. From the wing Frank Murphy kicked the ball towards goal. Straight to three Collingwood men it sped. It looked a certain goal. Ferguson. the only Geelong defender near. dashed to intercept the ball. As he ran he fell, and took a sensational mark Iaying on his back, a few seconds before the final bell announced Geelong 1925! League premiers. Geelong that day had every man at his top. but Chambers, Johns. Rankin, Rayson, Leahy, Warren, Hudd and Greeves excelled. Hard battlers for Collingwood were Syd. Coventry. Webb. Stainsby, Chesswas, Dibbs and F. Murphy. Gordon Coventry did well except in shooting; he never got a goal! Delirious with joy supporters carried victorious Geelong players in shoulder high. For a long time, their dressing room shook with sounds of wild rejoicing. The Collingwood captain's tribute was “The better side won." 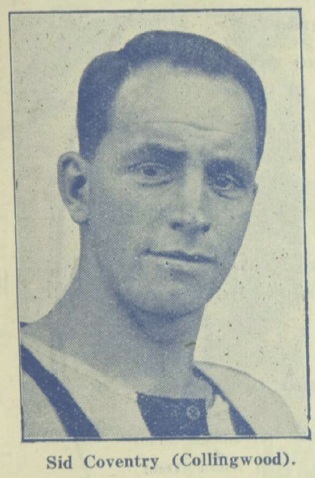 Dave Hickinbotham, captain of the previous Geelong team to win the premiership – in the old Association in 1886 – said “I’ve waited nearly 30 years for this”, “I must be a lucky mascot” said Tom Fitzmaurice who had also played in the 1923 and 1924 Essendon premiership sides. Tom is still playing with North Melbourne. His prospects in another premiership side are not bright. Finally Cliff Rankin tired but happy emerged from the dressing room wearing a ‘bell-topper” with blue and white streamers flowing from it. He had to make a speech to admirers. The riotous welcome to the special train carrying the premiers began as soon as it reached North Geelong. There was a chorus or engine whistles and fire-bells. The moment the train reached Geelong. the famous St Augustine Orphanage Band struck up. 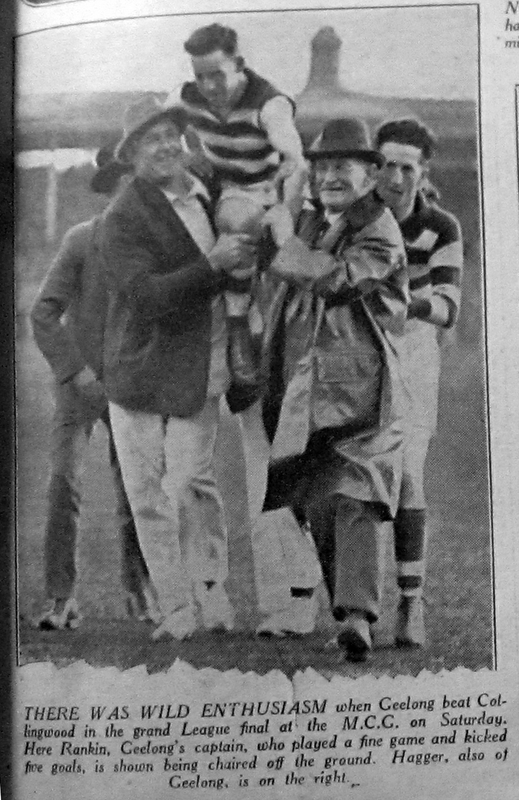 "The Conquering Hero’s” Half Geelong seemed to be there. Players were literally dragged from carriages and whisked away in cars through cheering crowds to the City Hall for a civic reception. There in a rousing speech. 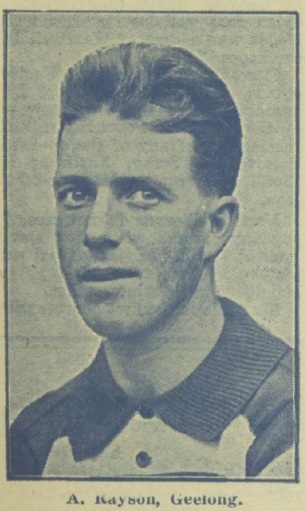 Cliff Rankin said: “I am captain of a great side, in which every man was captain in his own part”. Lloyd Hagger. with 77 goals, topped the League goal-kicking that season. Gordon Coventry (68) and Jack Moriarty (64) following. It was Ivan More’s second season as secretary. Another article on this website, 1925 - The First VFL Grand Final Radio Call reviews this Grand Final from a different perspective.